Sho is an interactive environment for data analysis and scientific computing that lets you seamlessly connect scripts (in IronPython) with compiled code (in .NET) to enable fast and flexible prototyping. The environment includes powerful and efficient libraries for linear algebra as well as data visualization that can be used from any .NET language, as well as a feature-rich interactive shell for rapid development. Sho is available under the following licenses: Sho for IronPython 2.6 license and Sho for IronPython 2.7 license. See the Installers page for more details about the two versions. 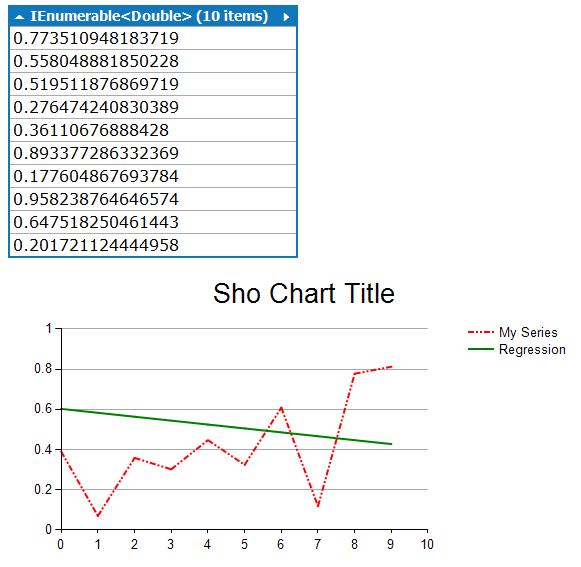 If you take a small slice of the awesomeness that is Sho, and use it with LINQPad you can create visualizations easily. The scriptability experience afforded by gnuplot or R is easily duplicated with Sho and LINQPad, however; if you now LINQ the experience is easier and more intuitive in my opinion. Slice and dice the data in C#, and then pass the IEnumerable<> to Sho for rendering. To get started, install Sho by downloading and running the MSI. To run the Sho shell you need to install IronPython, but for these examples, I am only using the Sho libraries so you can skip the IronPython install if you want. As a first example plot 100 random numbers using Sho. The amount of code required to dump this chart is small, just three lines (minus the boiler plate). Add a data series to the chart. Sho’s charting can do much more. Let’s tweak the previous chart a little bit. Change the line color and style, insert a legend, and add a title. 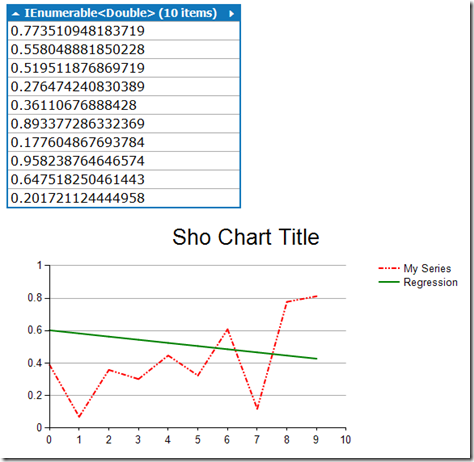 Overlay a regression line on the chart to better understand the shape of the data. When I pull data from a DB or a OData I usually want to visual it. I want to understand the shape of my data, and get a better understanding of what it is trying tell me, i.e. graphical analysis. I do this using either Excel, R, or gnuplot. Excel is easy to get to from LINQPad, just export, select, and chart. R and gnuplot are more involved, but create beautiful visualizations. Sho means I do not have to leave LINQPad. I do not have to fiddle with Excel wizards or menus to create graphs. I do not have the power of R or gnuplot, but enough to get the job done. I use LINQPad and Sho to create quick reports that I can share with my colleagues. Use the Dump() functionality of LINQPad to create a table, and use Sho to create an appropriate visualization immediately below it. Export the LINQPad result window to HTML, convert the HTML to an .MHT file, and viola – a quick a dirty analysis of your data in one file that can be viewed by anyone. I’m doing Sho a disservice by only focusing on the visualization aspects – it can do so much more. See the documentation to find out what else it can do.